Your eyes are not just windows to your soul, but to your health as well. People rarely pay attention to their eyes, until something goes wrong. The eye is a delicate organ, and vision is a complex process involving various components. Photoreceptors, in particular, get a lot of attention from researchers because they're the main cells in the retina that make vision possible. They convert light into electrical signals, which are sent to the brain and used to construct the images we see. Also, many retinal diseases begin with loss of photoreceptors. However, the retina is like a multi-layer cake, with each layer comprised of different types of cells, all playing important roles in retinal health and vision. While preserving and restoring photoreceptors is often job number one for scientists, they also explore ways to protect other retinal cells from deterioration and even harness them to restore vision. Choroid - The choroid is a layer of blood vessels that supplies oxygen and nourishment to the retina. Defects in the CHM gene cause choroideremia, a disease characterized by deterioration of the choroid, retinal pigment epithelium (RPE) and photoreceptors. In the wet form of age-related macular degeneration, leaky blood vessels expand from the choroid into the retina – a process called choroidal neovascularization – which causes loss of photoreceptors and central vision. Retinal pigment epithelium - Also known as the RPE, this is a single layer of cells above the photoreceptors that provides them with essential nutrition and waste removal. In age-related macular degeneration (AMD) and Stargardt disease (SMD), toxic waste products accumulate in the RPE or between the RPE and photoreceptors. Subsequently, the RPE deteriorates, leading to loss of photoreceptors. 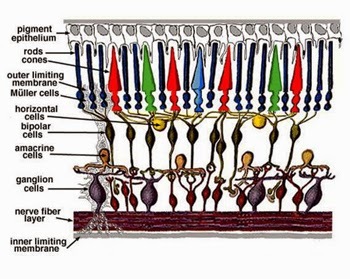 Photoreceptors -These are the retinal cells, known as rods and cones, that initiate the vision process by converting light into electrical signals. Rods provide low-light and peripheral vision. Cones are concentrated in the macula, the central region of the retina, and provide central and color vision. The outer segments of rods and cones are antenna-like projections that absorb light and convert it into electrical signals. Inner segments are the cell bodies where other supportive functions are performed. The adult human retina has approximately 125 million photoreceptors. Bipolar cells - Their job is to receive electrical information on lighting intensity from photoreceptors and pass it along to other retinal cells. Bipolar cells often survive after photoreceptors are lost to disease. This makes them an attractive target for emerging optogenetic treatments, which are designed to provide light sensitivity and restore vision. Ganglion cells - Ganglion cells receive input from many different cells in the inner retinal layers and process visual information, including detection of edges, contrast and colors. Ganglion cells extend to form an optic nerve, a million-fiber cable that conveys visual information from the eye to the brain. In people with advanced retinal disease, ganglion cells often survive longer than bipolar cells, making them a potential target for optogenetic therapies. Currently, scientists believe that bipolar cells may provide a more detailed visual experience than ganglion cells when treated with a light-sensing therapy, because they reside in layers of the retina closer to photoreceptors. Muller glia - Muller cells extend through the retina, like spokes of a wheel, providing structural support and guiding light through the inner retina. They also transport molecules critical to retinal health and vision. Researchers believe Muller cells may even have the capacity to become new photoreceptors, which could lead to restoring vision. The research is still new, but success might someday have a big impact on the vision of people with advanced diseases. The processing of visual information in the retina-beginning with 125 million photoreceptors and converging on a one-million-fiber optic nerve-remains a subject of intense research. There's still much that scientists don't know about the retinal cells and their roles. For example, little is known about the processing activities of amacrine and horizontal cells, which reside between bipolar and ganglion cells. However, advancing imaging technologies, including adaptive optics and optical coherence tomography, are helping complete the picture. For additional information about retinal anatomy and function, please see the Eye on the Cure post "Appreciating the Beauty of the Retina." The University of Utah's Webvision is one of the best online sources for detailed information about the retina. I also want to thank John Flannery, Ph.D., at the University of California, Berkeley, for his editorial input.